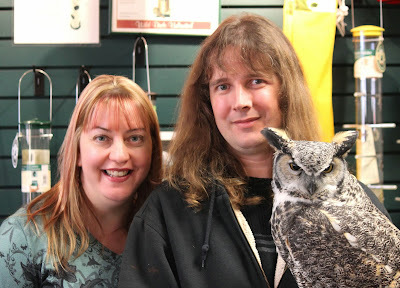 Us with our feathery friend, Alex, on our first wedding anniversary. Rob and I had a most memorable first wedding anniversary. It was the day we had a Snowy Owl in our truck. Three years ago, when we first heard about and visited the Owl Foundation, Rob signed up to be a volunteer driver. They have volunteers all over Ontario who transport injured owls to their facility in Southern Ontario. This past Saturday, November 30th, was our one year wedding anniversary and the first time we helped deliver an owl to the foundation. 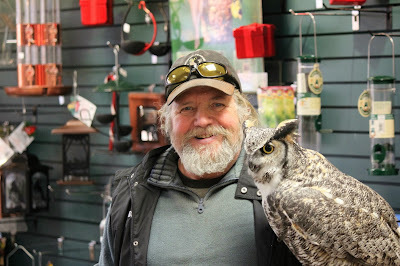 Now, Rob and I are never happy to hear about an injured owl or any bird or animal for that matter, but getting to help one this day, made the day even that much more special for us. We didn't have any real plans for the day and when we got the call we were more than happy to help. The volunteer drivers often work in teams to get the owl to the foundation and today was no exception. Our friends Murray and Debbie, who are also volunteer drivers, drove about an hour north of Toronto to pick up the owl, brought it to our place, and we made the drive south to the Owl Foundation. It was a cold and quiet drive. We didn't turn the heat on for the owls comfort. No music was played and very little talking, as we didn't want to cause the owl any more stress. During the drive I couldn't help but think "I can't believe we have a Snowy Owl in the truck!". The owl didn't make a peep the whole drive. We were happy to deliver the owl to the foundation and after a quick peek at our special passenger, a gorgeous female Snowy Owl, and a few words with the staff, we were on our way back to Toronto. Feeling good after delivering our special passenger. We made it back to the city in time to visit the open house event going on at our local Wild Birds Unlimited, who had some special guests of their own. 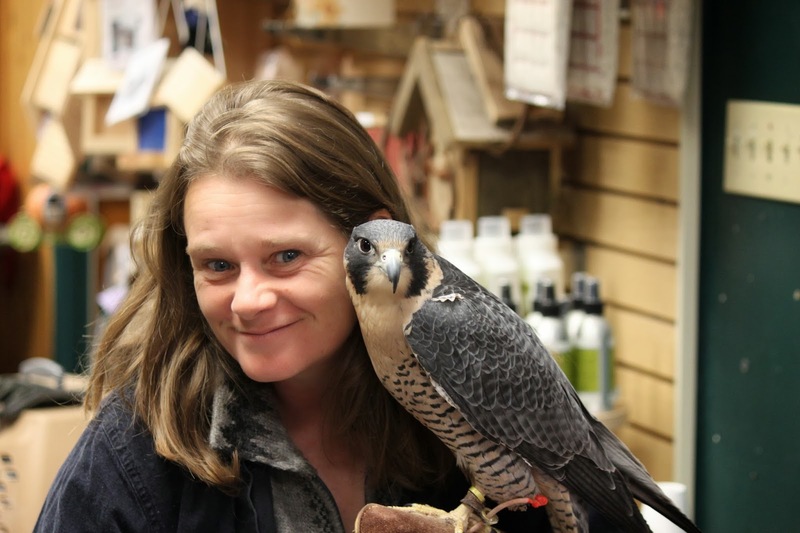 Tracy and Bruce from the Canadian Peregrine Foundation were there with a couple of the educational birds, Alexandra, a Great Horned Owl, and Cheyenne, a Peregrine Falcon. We have never seen the store so packed! We also volunteer with this organization, so it was nice to see so many people there to check them out. Rob relieved Bruce for a while by holding Alex, as she can get a little heavy after a while. Rob was thrilled to hold Alex for almost an hour. Tracy with Cheyenne, not sure who loves who more. Bruce with Alex. 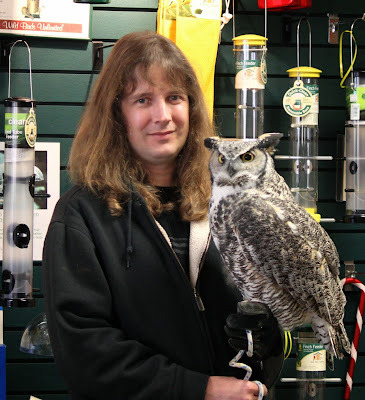 Bruce was in charge of fledge watch at our site this year. After spending over an hour at the store we had to leave to get ready for our dinner date. We were finally trying a restaurant I'd been wanting to check out for years, La Castile. The food was delicious, and I loved the atmosphere. I felt like I was in an old castle, and Belle and Beast (Disney) were going to walk around the corner at any moment. It is a place to go and enjoy a long, leisurely dinner. Rob's parents often go here to celebrate their wedding anniversary, which is part of the reason we decided to go here, and we will make it our anniversary spot as well. As great as the dinner was, I'd be lying if I didn't admit the birds really made our anniversary as special as it was. It really was a pretty amazing first wedding anniversary for a couple of bird-nerds! NOTE: I called to inquire about the Snowy Owl today and was told she is doing very well. Due to the seriousness of her injuries she will be over wintered at the foundation. They believe she was hit by a car due to the bruising and swelling. She has some eye damage as well, but no broken bones. They were moving her to an outdoor enclosure today and she is eating well, all good signs. I will call again in the new year for another update and we are all hopeful for a good recovery and release. She's in the right place for both. 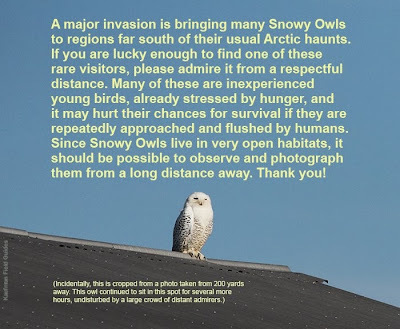 There seems to be an irruption of Snowy Owls this year, please read and share the following advice. Thank you. What wonderful work you do! Well done!